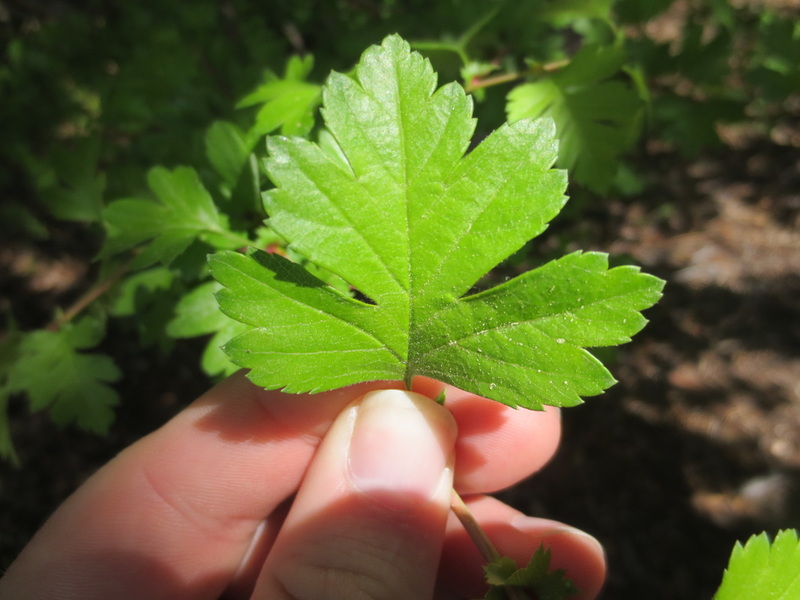 This information will help you identify hawthorn species. 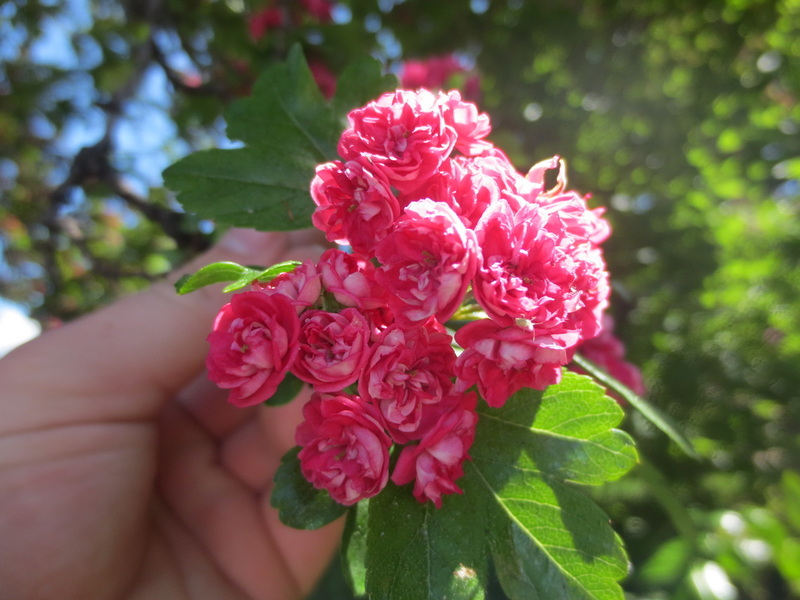 Most hawthorn species belong to the genus Crataegus, which is in the family Rosaceae. 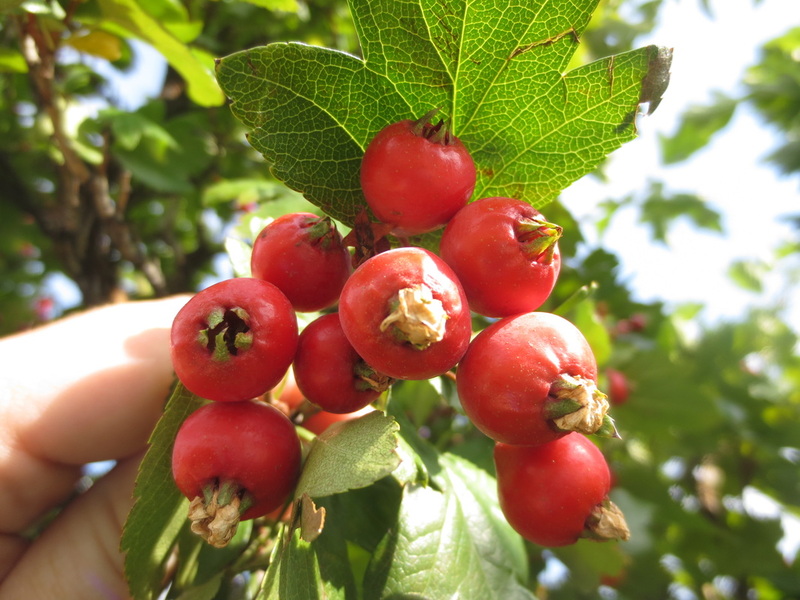 Crataegus come from the Greek kratos, meaning ‘strength’ due to the hardiness of the wood. The common name ‘hawthorn’ comes from the Anglo-Saxon haguthorn, meaning ‘a fence with thorns’, which is a homage to its early use as a hedge. 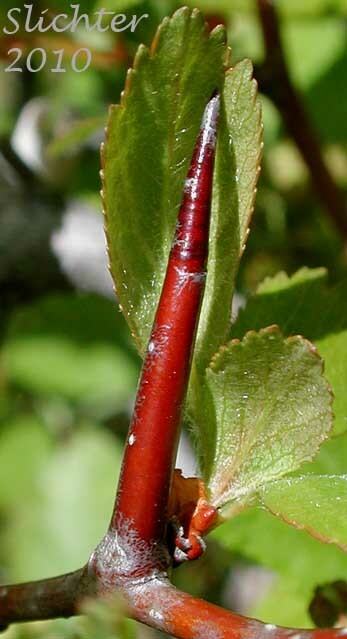 Hawthorns are small trees and/or shrubs with with rough, scaly bark and branches that somewhat zigzag. The branches have thorns with buds beside them. 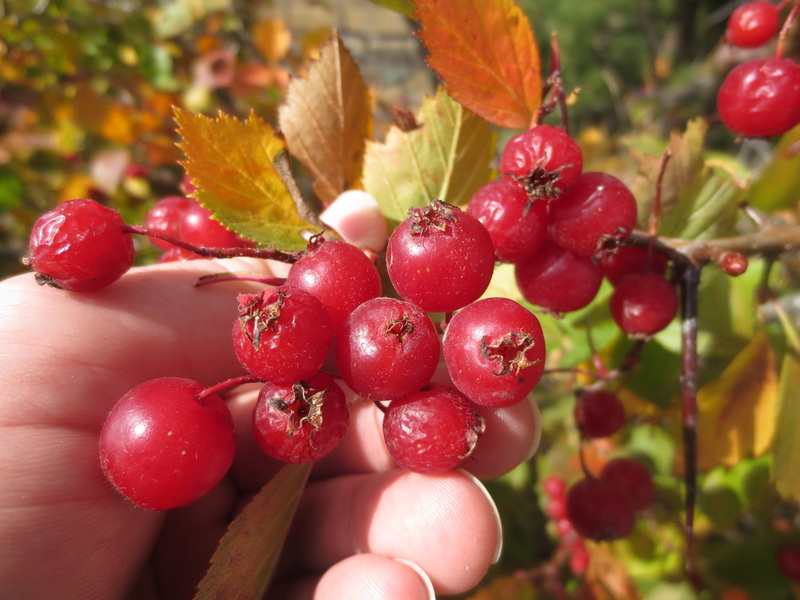 There are essentially two types of hawthorn in the Okanagan: native and ornamental. The difference between the two can sometimes be tricky, but generally differences are in the physical characteristics and where you find them. In general, native hawthorn are wild (along water banks or roadsides), have many thorns (short, 1 cm, to long, 7 cm, or more), leaves shallowly lobed, multi-stem, and white flowers with 5 petals and about 10 stamens (the stalks in the middle of the flower). 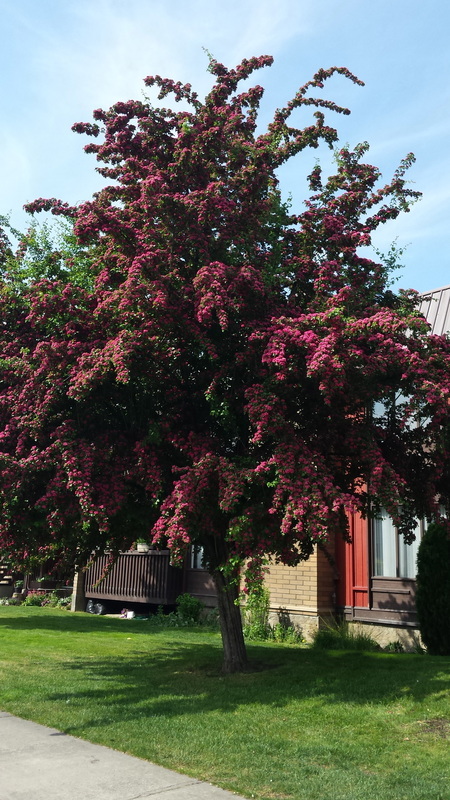 In general, ornamental hawthorn can be bought at plant nurseries and usually planted in residential gardens, have little to no thorns, leaves deeply lobed, single stem, and pink to dark pink flowers with more than 5 petals and about 15 to 20 stamens. 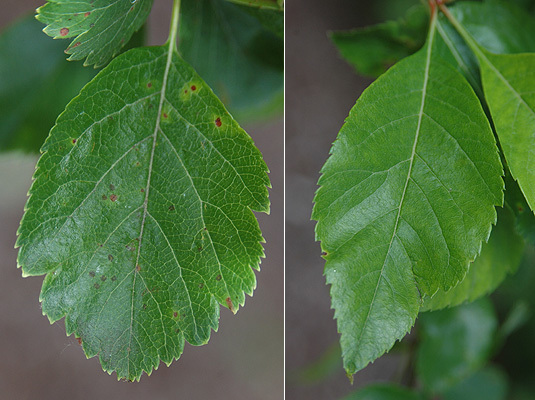 Take a look below at the comparison between native and ornamental hawthorn. 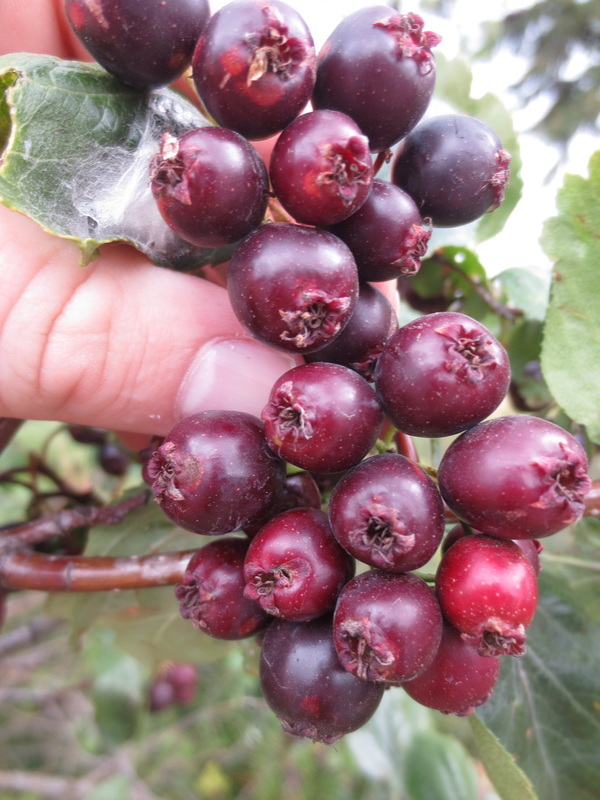 The black hawthorn, Crataegus douglasii, is a low to mid elevation hawthorn species widely scattered and locally abundant along streambanks and lakes, on open, warm slopes, in open deciduous forests, as well as along roadsides and fields. They are typically not found in dry, cold climates. Their range in BC extends the lower 2/3 of the province. They have a similar distribution in Washington state, though mostly coastal forest and ponderosa pine ecosystems. C. douglasii ranges in size from a large deciduous shrub to a small tree up to 8 meters tall. The bark is grey, rough, and scaly, and the branches are dark reddish brown with stout, straight thorns ranging from 1 to 3 cm long (Fig. 19). 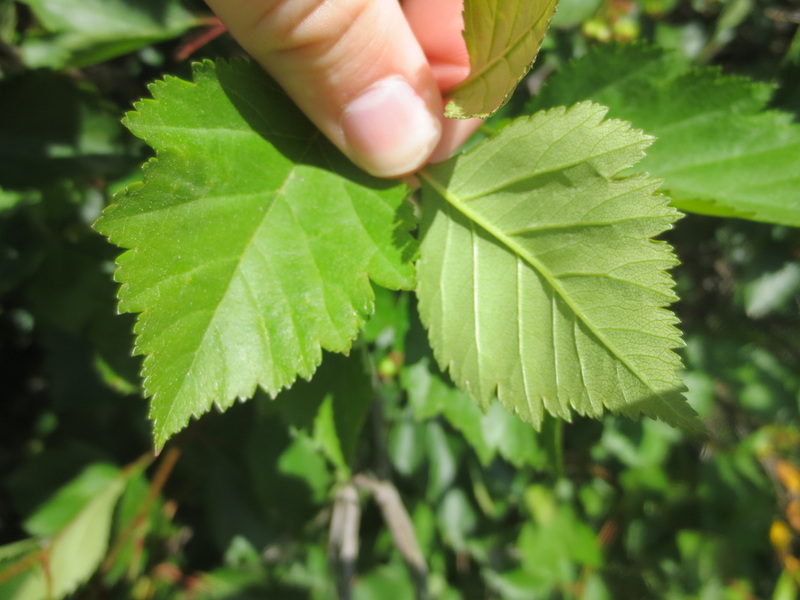 The leaves can grow up to 7.5 cm long and are oval and thick in shape with 5 to 9 small lobes at the tip (Fig. 20). They are leathery to the touch and dark green on top and paler below in colour. The flowers are white and saucer-shaped with 5 rounded petals with 10 stamens and found in clusters at the branch tip (Fig. 21). The flowers blossom during April and May. The fruits are small, blackish-purple in colour, and apple-like and found in clusters (Fig. 22). Each fruit has a single, large, hard seed. The fruit withers soon after ripening, which is by late July. 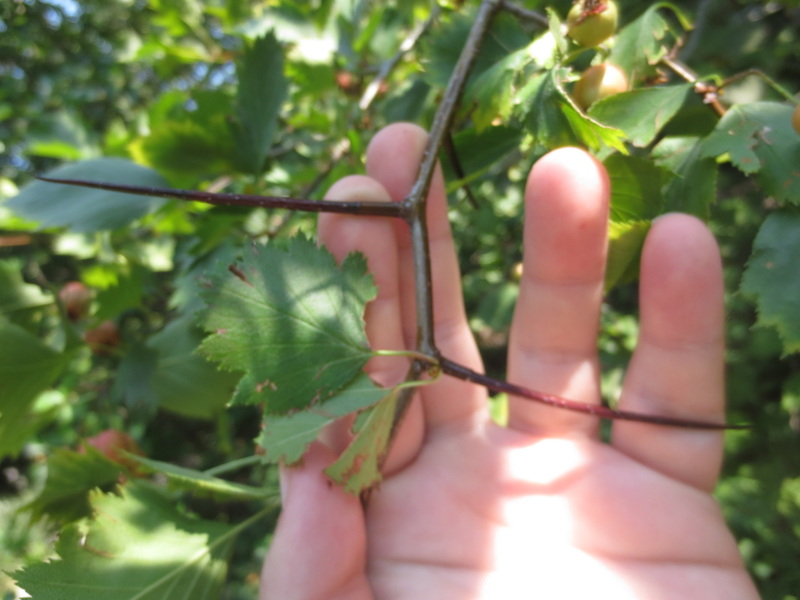 Suksdorf’s hawthorn, Crataegus suksdorfii, is very similar to the black hawthorn, but the bark is pale greenish brown and the thorns are half the size, about 8-12 mm long. 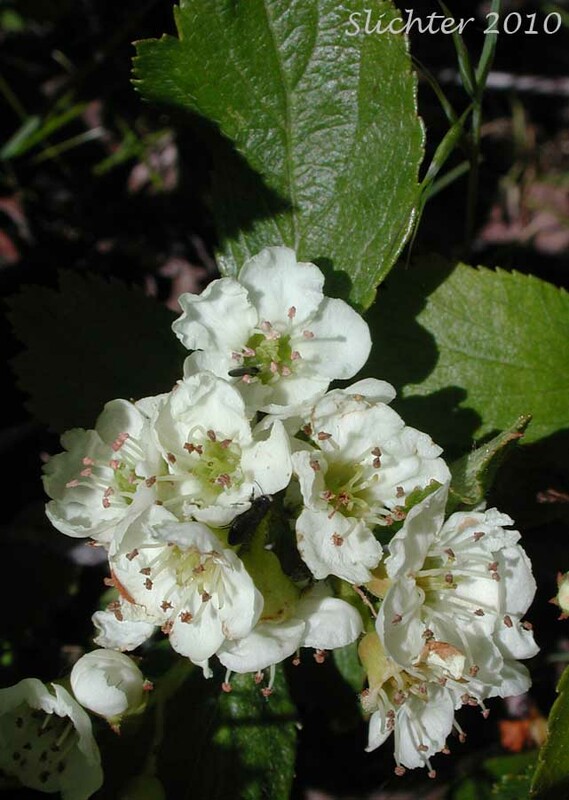 The leaves are more narrower than the leaves on the black hawthorn, but the flowers are roughly the same size, except the flowers have more stamens, 15 to 20, than the black hawthorn. 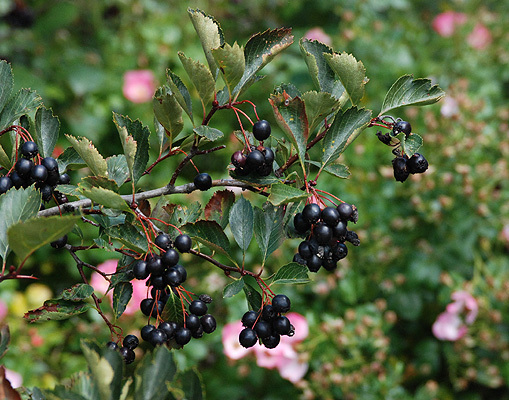 Found were black hawthorn can be found, but mostly in moist, low-lying sites and along stream banks. 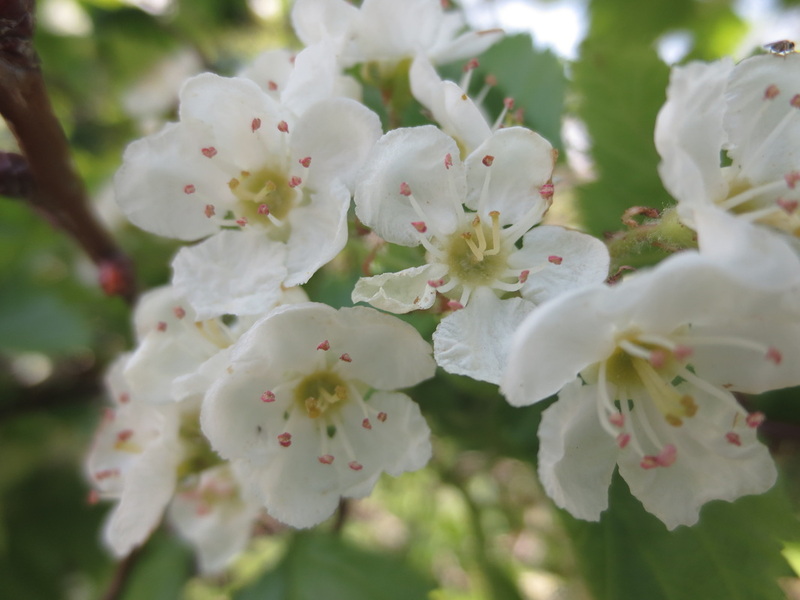 To differentiate between Suksdorf and black hawthorn, count the stamens in the flowers: Suksdorf’s hawthorn will have 15 to 20, while black hawthorn will have about 10. 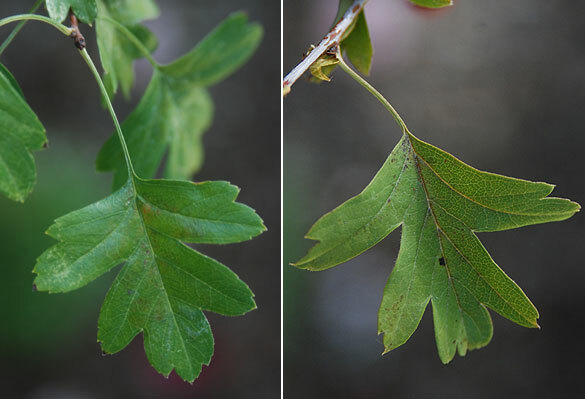 If flowers are unavailable, the colour of the branches are the next reliable indicator: Suksdorf’s hawthorn have pale greenish brown branches, while the black hawthorn have dark reddish brown branches. 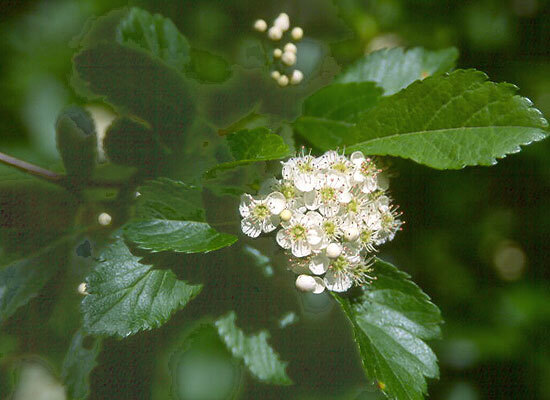 If Suksdorf’s and black hawthorn grow together, it has been observed that Suksdorf’s hawthorns will start flowering after the black hawthorn has finished flowering. The Piper’s hawthorn, Crataegus chrysocarpa var. 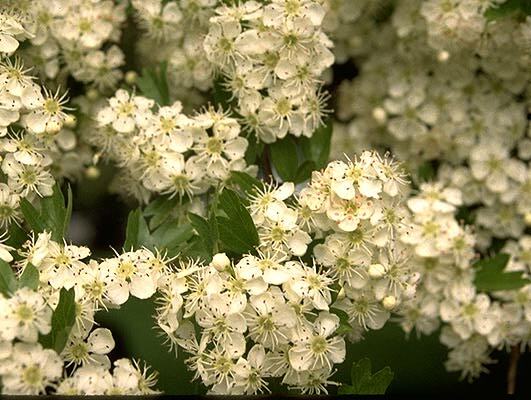 piperi, is a smaller, coarser shrub-like hawthorn species, about 3.5 m tall, and less common than the black hawthorn. 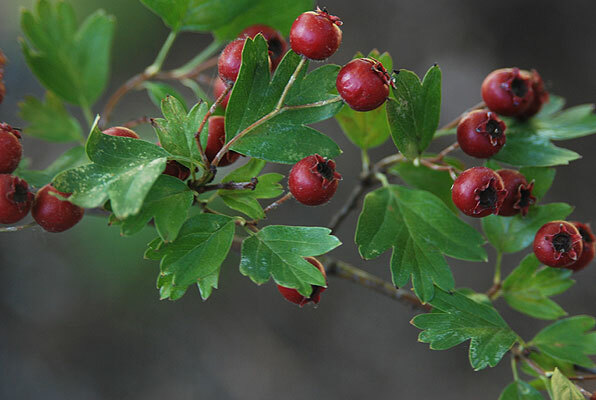 The Piper’s hawthorn has long, slender, slightly recurved thorns, about 3 to 6 cm long, and the fruit colour is salmon-orange young and bright red mature. They can be found in valleys, streamsides, sagebrush, pine forests, and along fencerows. They can be found in the lower half of B.C. from the coast to the Rocky Mountains. The common hawthorn, Crataegus monogyna, is a small tree, about 10 m tall, with dark, grey-brown, scaly bark. 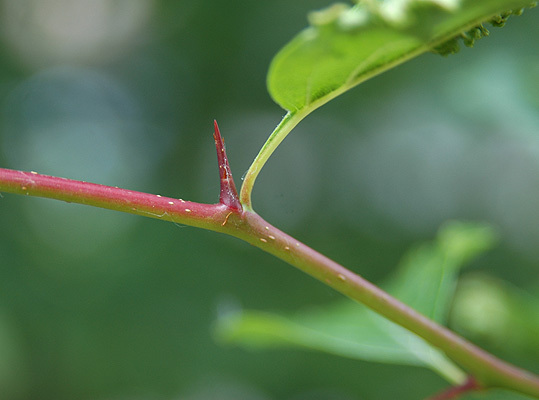 The thorns are small, only about 1 cm long. 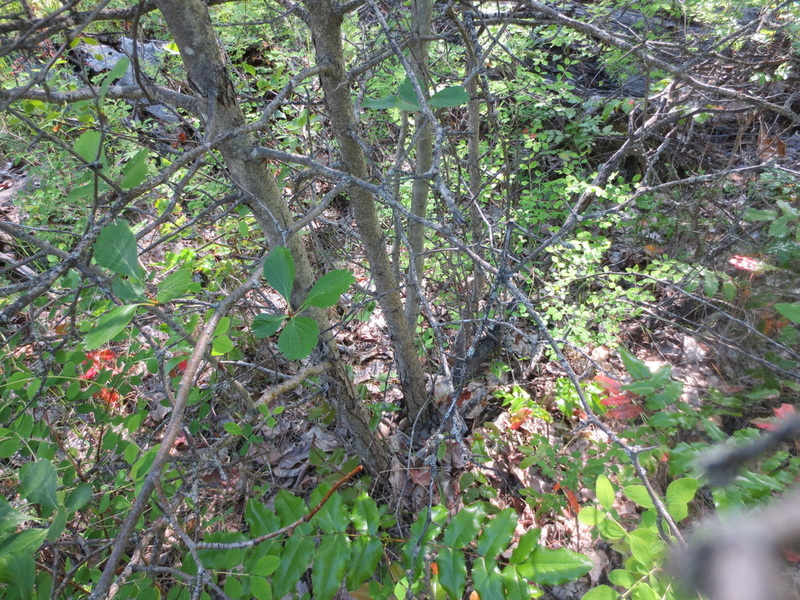 The shrub has spiny limbs, deeply lobed leaves, and red to scarlet-coloured fruit that persists over winter (Fig. 24-25). Native to Europe, but is commonly planted here in BC. Its range is widespread in southern Vancouver Island and the lower mainland in moist and open areas. To add host data to this project, click the 'Add a Site' button below. Brayshaw, T. C. (1996). Trees and shrubs of British Columbia (No. 31). UBC Press. Flora of North America Editorial Committee, eds. (2015). Flora of North America North of Mexico Volume 9: Magnoliophyta: Picramniaceae to Rosaceae. New York and Oxford. Lyons, C. P. and B. Merilees. (1995). Trees, Shrubs and Flowers to Know in British Columbia and Washington. Lone Pine Pub. Parish, R., R. Coupé, and D. Lloyd (Eds.). (1996). Plants of southern interior British Columbia. Vancouver, BC: Lone Pine.